Brian Vanderhoop stands in the stern of his 20-foot plywood scallop boat with his hand on the throttle of the outboard, navigating the channel from West Basin to the open water of Menemsha Pond on Martha's Vineyard. The green water of the salt pond glints as the morning sun peers from behind fast-moving clouds and illuminates the low dunes. He sets two scallop dredges on the Aquinnah side of the pond, and in just a few minutes he winches aboard the first haul. The mesh bag is filled with clapping bay scallops, fat quahogs, seaweed, and the odd crab. As he empties the bag on the culling board, he flashes a smile. It's a good catch. Half a dozen other boats fishing in the same area, two operated by Vanderhoop's brothers, are having similar luck. In addition to being a shellfisherman and running a charter fishing business in the summer, Vanderhoop is the shellfish constable for the town of Aquinnah on Martha's Vineyard. His father, William, held the job for more than a decade before Brian took over three years ago. "I'd rather be out here working for myself than working for somebody else," Vanderhoop says as he sorts the catch. "Plenty of shellfish, beautiful place." He is a big man of Wampanoag descent with a boyish face and a ready smile. He takes his job seriously. Vanderhoop has reason to smile today. The scallop harvest this year, more than 2,500 bushels from the Aquinnah side of Menemsha Pond, is the best in over a decade, and since scallops are scarce off-island, the price is the highest in memory. The pond is also supporting a healthy quahog population, and small-scale aquaculture of shellfish is growing here. Things are looking up for shell fishermen in Aquinnah these days, but this has not always been the case. The early '80s were a boom time in the bay scallop fishery on Martha's Vineyard and Nantucket. Ponds and harbors on both islands were producing record harvests, and supporting scores of fishermen. In 1982, Nantucket scallopers alone landed 120,000 bushels. Vanderhoop says Menemsha Pond yielded a record harvest in 1985. Then, from 1986 to 1996, the scallops were 'just nonexistent," he says. The pond was closed to scalloping. A similar trend was reported in ponds and bays throughout the Northeast, and biologists are still at a loss to explain why. Scallop catches declined at a time when the maritime communities of Cape Cod and the islands could ill afford it. The collapse of the ground fish stocks on Georges Bank was already forcing many fishermen into other fisheries--or out of work. Most bay scallop populations remain in decline today, but they are beginning to make a comeback in a few of the region's bays, harbors, and ponds. These include Menemsha Pond, which is shared by the towns of Aquinnah and Chilmark, and Lagoon Pond. Both ponds are on Martha's Vineyard. Nestled among the oaks and pines on the shore of Lagoon Pond is the solar-powered hatchery and tiny office of the Martha's Vineyard Shellfish Group. This unusual organization, consisting of the shellfish departments of five Martha's Vineyard towns, has been at the forefront of efforts to confront the scallop decline with practical measures. With a commanding voice and an affable manner, Rick Karney, Shellfish Group biologist and director, has a lot to say about shellfish. He has spent the past 23 years coaxing scallops, quahogs, and oysters to spawn in the hatchery tanks with carefully controlled temperatures and plenty of good food, then nurturing their young until they are large and robust enough to be released into the island's public shellfishing beds, a process called seeding. The work of the Shellfish Group has become an example for other communities grappling with shellfish management dilemmas. 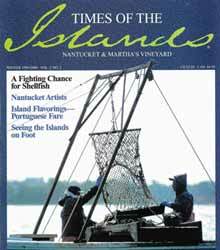 Karney began working for the Martha's Vineyard Shellfish Group in 1976 when the shellfish constables of the island's six towns agreed to pool their resources to hire a biologist to assist in their efforts to protect and enhance their shellfish harvests, which at the time represented as much as 10 percent of the island's economy. Scallops are a particularly important economic resource, because they are harvested in the winter when service industry jobs are scarce. As offshore fishing dried up, many fishermen were turning to scallops to see them through lean times. An early goal of the Shellfish Group was to develop a hatchery program. It built a small shed to house the fledgling project in 1976. The pilot shed is now dwarfed by the hatchery building constructed in 1979. It uses active and passive solar power to heat the building and warm the water for shellfish culture. It was the first public hatchery of its kind. "It hasn't always been easy here," says Karney of the early days of the Shellfish Group and the hatchery. Design flaws in the new hatchery and the fluctuating commitment of some of the member towns were challenges. The resolve and engagement of the island's shellfish constables, however, were instrumental in seeing the project through this difficult period, says Karney. "I really have to give them credit. They've supported me to the end." In 1980, the Shellfish Group became a nonprofit corporation. Its board of directors is made up of a selectman and the shellfish constable from each of the member towns. Each of the towns contributes financially to support the program. Additional support comes from grants, fund-raisers, and private donations. Today, the Martha's Vineyard Shellfish Group has a small, cluttered office and a year-round staff of three. Last year it provided the member towns with 7 million quahog seed, 4 million oyster seed, and more than 5 million scallop seed. The one-millimeter bivalves are cultivated by the shellfish constables for one year before being planted in the shellfish beds. In addition to the hatchery, the Shellfish Group operates a scallop nursery on Chappaquiddick in Edgartown, where seed scallops are raised in the clean and productive water of Cape Poge Bay. Over the years, Karney and his associates have pioneered a number of innovative techniques to increase hatchery production. "We are always tweaking the system to get more animals to survive," he says. The system uses no antibiotics or chemicals, and it relies on selecting the strongest and healthiest animals from the millions of tiny larvae in the brood tanks. The Shellfish Group has developed several techniques for enhancing wild populations, too. For instance, scallop-spawning sanctuaries are set up in many of the Vineyard's ponds. These mesh cages protect adult scallops from predators and hold them in warm, shallow areas most suitable for spawning.